Connected Health » Fitness Gadgets, Health Gadgets » Nike launches new running suit inspired by… golf balls?! Nike launches new running suit inspired by… golf balls?! The clever minds over at Nike HQ have developed a new running suit, which claims to significantly improve sprint times during the Olympics this summer because of its unique design based on… wait for it… the surface of a golf ball. At the Olympics this summer, American, German, Chinese and Russian athletes will be wearing a new suit developed by Nike called the TurboSpeed. 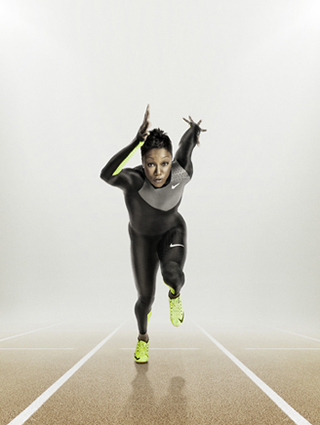 According to Fast Co Design, researchers at Nike claim the fancy new suit will improve 100m sprints by as much as .023 seconds, which is a huge amount of time for such a short race. You may aso be surprised to learn that the TurboSpeed is rather environmentally friendly for a suit that looks like it’s from a sci-fi film. It’s made from 82% recycled polyester fabric, using around 13 recycled plastic bottles per suit!